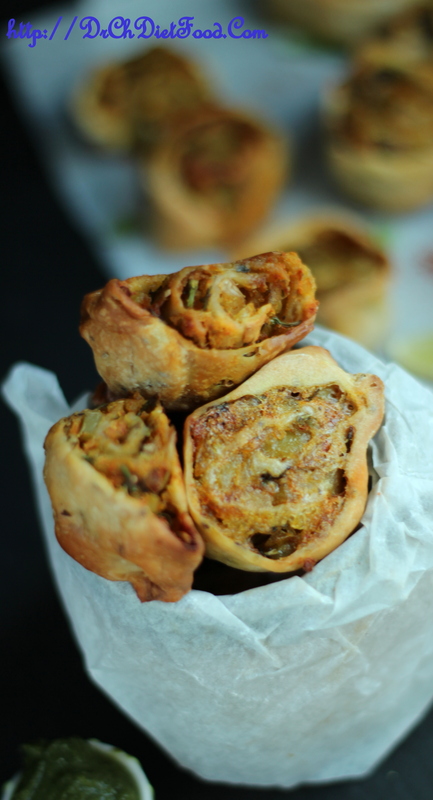 These baked samosas bites/pinwheels are an alternative way to enjoy healthy snack. Here I used wheat flour in the dough and baked the pinwheels using little oil. 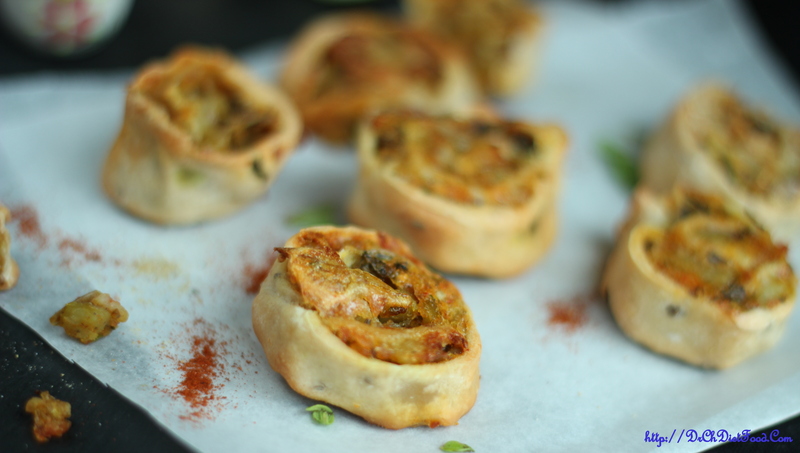 This is an easy snack and can be served for a evening tea time snack or even as a party appetizer. In a mixing bowl combine flour, salt, carom seeds and oil – add in little water at a time and mix well to form a soft pliable dough. Wrap with a cling film/kitchen towel and set aside for 10-15minutes. Now in a bowl add in cooked potato and mash it completely without any lumps and to this mashed potato add in chopped bell peppers, chilli powder, chat masala, garlic paste, mango powder, salt and mix well until well combined. Pre-heat the oven at 180deg C, line the baking tray and set aside. Now take the dough and divide into lemon sized balls and take one portion roll it into a 5-6inch diameter circle. 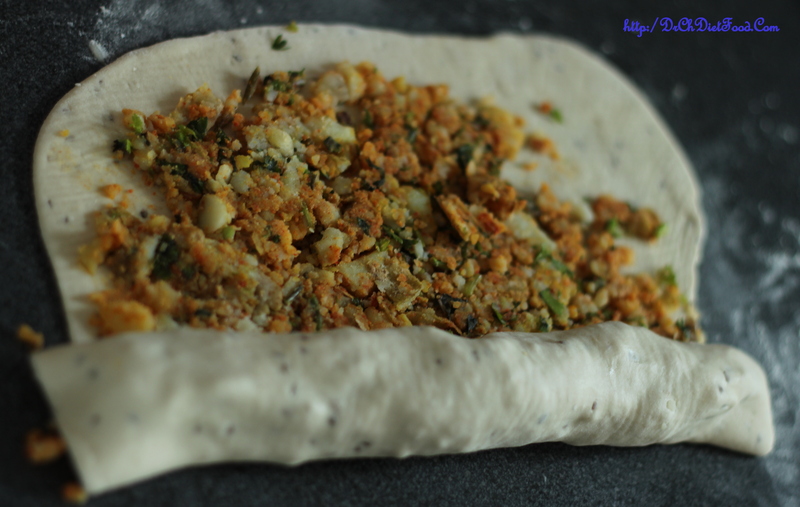 Spread a layer of potato filling evenly over it, roll it into a log, seal the edges. Cut the log into ½-1inch thick slices and arrange on the prepared baking tray one after the other without overlapping. Repeat with the remaining dough and once all are done brush the samosa rolls with oil and bake in the pre-heated oven for 25-30minutes (time may vary from oven to oven ) so bake until it golden brown. Plain flour can be used in alternative to wheat flour for the dough. 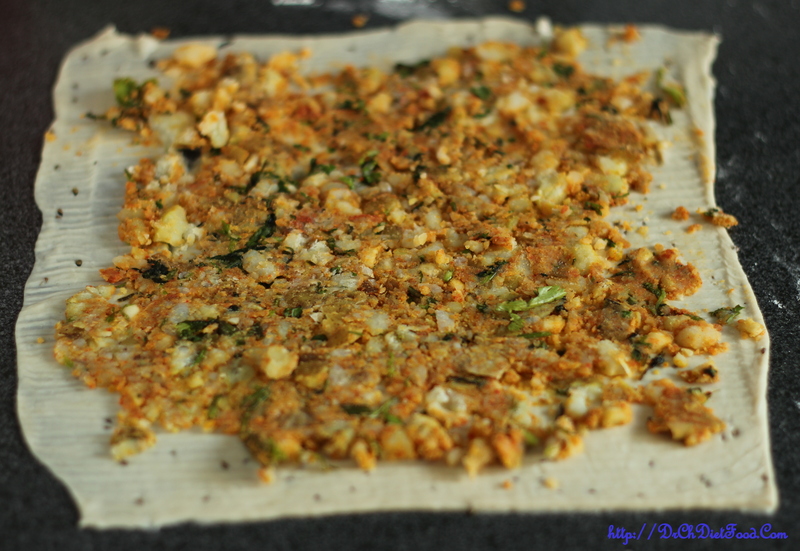 You can even saute the filling with some oil before making the rolls if desired. 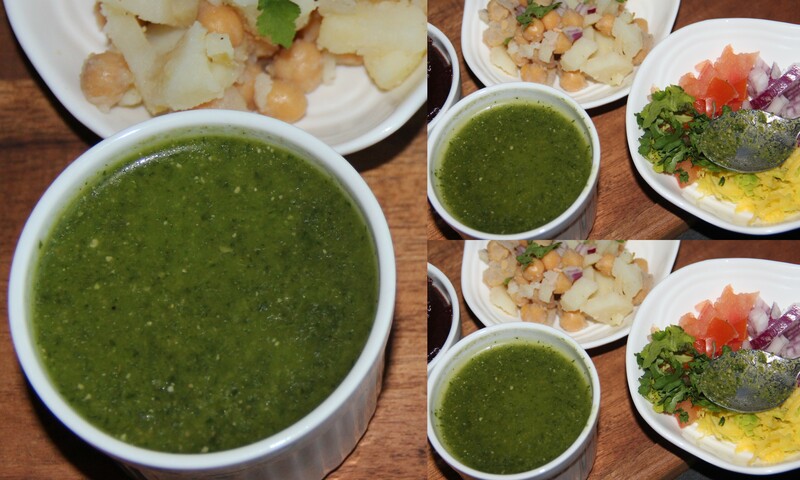 Posted on October 21, 2015, in Appetizers, International and tagged Baked Samosas, baked snacks ideas, evening healthy snacks ideas, Healthy snacks, indian healthy starters, pinwheel samosas. Bookmark the permalink. 47 Comments. I love samosa’s the restaurant I eat at all the time serves them with a sweet sauce tastes like it may be made from tamarind. Do you have a recipe for that? These sound so good–they look like delicious little snacks! 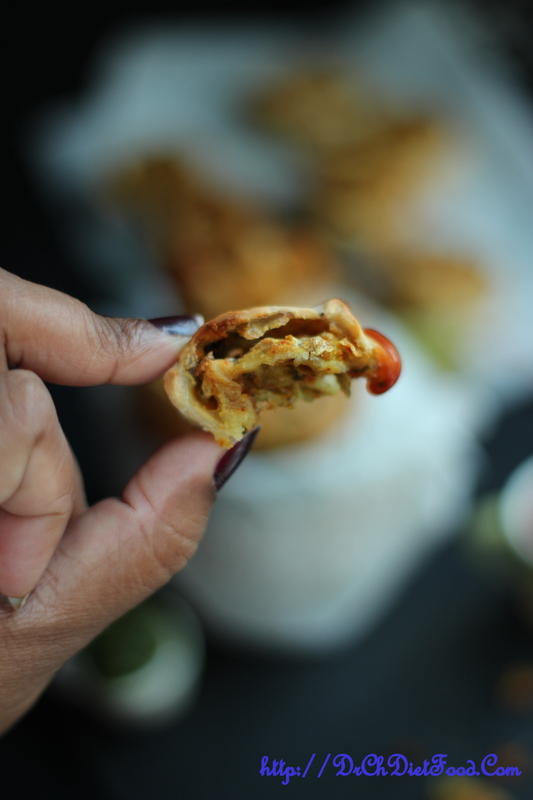 I love samosas, but yours look particularly amazing! I’ll have to give them a try, especially as they are baked rather than fried! 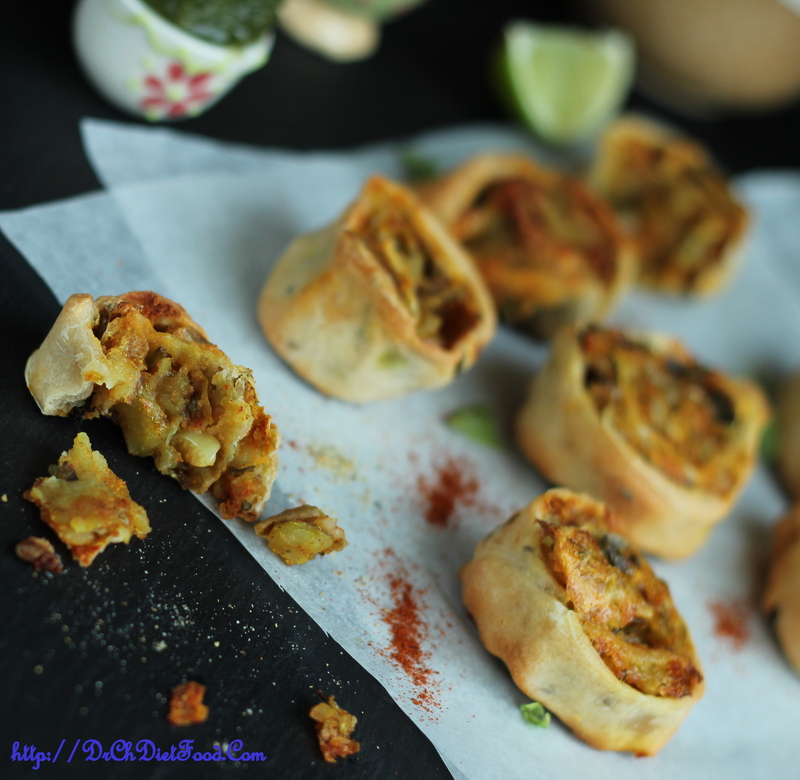 Thanks Auntjuju…I love to bake Indian snacks for a healthy version.. Thank you Alok for such kind words and motivation..